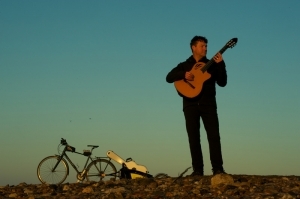 Richard Durrant is a stand-up, barefoot, un-classical guitarist. His playing is richly romantic, truly virtuosic and crosses all musical boundaries. He has appeared as guest soloist with the RPO in the Royal Albert Hall and played in the wilds of South America as well as tiny, English, village halls. Bookings for 2015 include the Wilderness Stage at Wilderness Festival and concerts in Spain and Paraguay. Richard has just recorded his brand new work The Girl at the Airport (for guitar and strings) with the City of Prague Philharmonic Orchestra. During an average year of playing concerts Richard travels 35,000 miles, which is why he undertakes much of his spring and summer touring on a bicycle carrying his stage show in his panniers and on a trailer. This is Richard�s effort to pay back, at least in part, his disgracefully large carbon footprint. For the last two years Richard has cycled over 3,000 miles playing 50 Cycling Music concerts around England and Scotland. This summer Richard has already cycled and gigged from Sussex to the Isle of Skye. Cycling Music has raised money for The Big C charity, based in Norwich (2014), and CDF, the Cyclists' Defence Fund (2015). Richard Durrant was born in Brighton. By the time he entered the Royal College of Music, aged 18, he had already dabbled in classical, folk and contemporary music and had a growing reputation as a concert guitarist. Following his official debut recital at the Purcell Room, Southbank Centre, London in 1986, Richard turned sharply left and pursued his diverse interests in electro/acoustic music, improvisation, composition and multi-media. He has remained, by choice, outside of the classical music establishment ever since, in fact he recommends a total abandonment of what he calls �the C word�. In 2008 Richard Durrant decided to end his studio based projects to concentrate exclusively on touring as a soloist. Since then his creative force has been focussed entirely onto the guitar fingerboard and the associated issues of staging and presentation. In recent years Durrant has won a devoted audience who have warmed to his relaxed, easy going manner, his obsession with innovative presentation and unpredictable choice of music. A magazine article (Classical Guitar May 2012) referred to his cross bench status; the journalist was impressed that the RD solo guitar gig he chose to attend took place in a rock venue and attracted a large audience. In addition to his extensive UK touring and occasional forays into Europe Durrant visited Paraguay for the first time in 2011. During this successful concert tour he launched the first album in his Paraguayan trilogy titled: The Number 26 Bus to Paraguay. This album is still the only collection of Barrios� guitar works to be launched in Paraguay by a foreign artist. The awards and accolades followed and Durrant returned to Paraguay a year later to launch the second album in the series titled: Hijo de Hombre. He also gave the Paraguayan premiere of the Villa-Lobos guitar concerto under the baton of maestro Luis Szaran. In 2013 he was invited to perform the Aranjuez Concerto in Asuncion to mark the reopening of the British Embassy in Paraguay. The concert included the premiere of Durrant's specially commissioned work for five cellos and guitar "Lamento y Danza�. Richard was recently added to Brighton's Walk of Fame, where he has his own interactive paving slab! Richard is Patron of Sussex based Guitars on the Beach, Ambassador for the Brighton Youth Orchestra and Board advisor to Paraguayan organisation Guitarras del Corazon. Richard lives on a beach in Sussex with his wife, four children, a cat called Stan and a huge, black Newfoundland called Bollo.